f'coffee - Matlock Bath, Derbyshire. Over the past few months, there's one particular coffee shop which seems to have been cropping up on my Instagram feed near enough every day. That place, is F'coffee in Matlock Bath. F'coffee opened their doors in summer 2016 and since then, have been well known in the area for their monstrous Freakshakes - a trend which is showing no signs of slowing down any time soon. 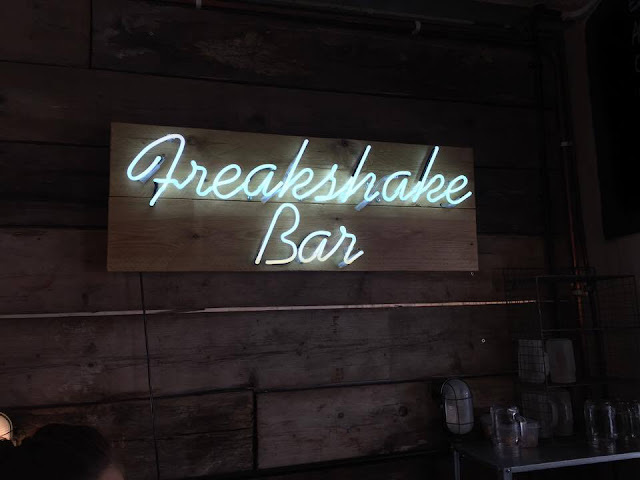 They also serve food but lets face it, it's all about the Freakshakes and homemade cakes here. One Saturday afternoon, me and Emily headed out for a summers drive and found ourselves in Matlock Bath. I mean, where else does anybody in Derbyshire go when it's sunny!? It's the closest we get to the seaside around here right? F'coffee is located on the end of the North Parade directly opposite the train station car park. I was so sure that we'd struggle to get a table on a day like this but it was our lucky day. We took a look through the drinks menu written on the chalkboard wall and headed to the till to place an order. 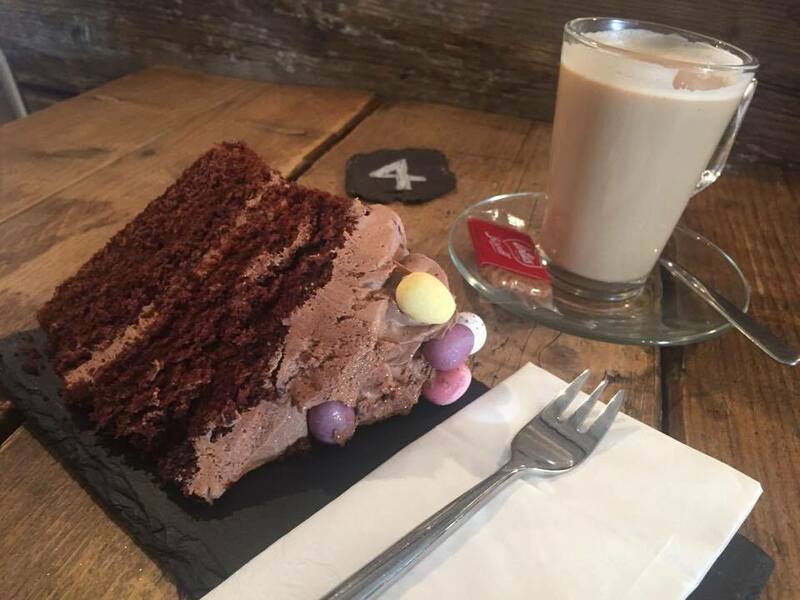 From the moment we arrived, Emily had her eyes on the cakes, eventually opting for the Mini Egg Cake along with a Latte. 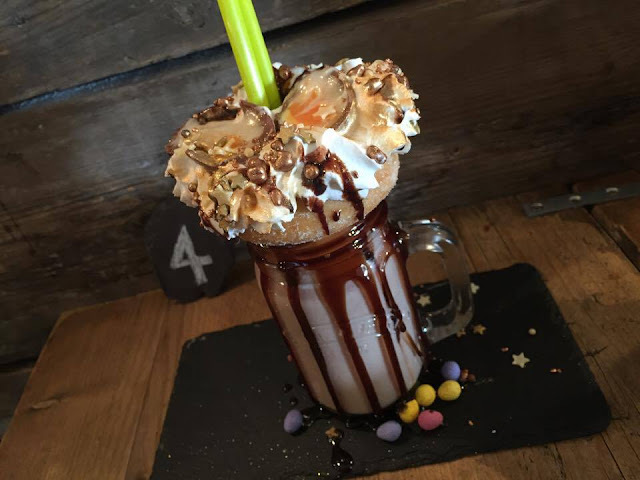 I decided to keep the Easter theme going and went for a Creme Egg Freakshake which is currently a limited edition flavour. A few minutes later, the cake and latte arrived and oh my word, I wish I could explain to you how big this slice was. 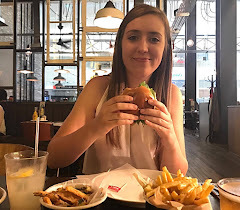 The waitress pointed out that if it couldn't be finished, just to let her know and she'd pop it in a takeaway box for later. The Mini Egg cake is every chocolate lovers dream. A scrumptiously soft sponge with silky chocolate buttercream and sprinkled with Mini Eggs to top it off. No, Emily couldn't finish it but she told me how delicious it was. She said she'd have liked more buttercream in the centre to balance it all out a little more but other than that, it was a winner. Now for my Freakshake. As mentioned earlier, I went for the limited edition Creme Egg flavour as I blinking love the things however, the standard flavours sound just as amazing. They have eight flavours altogether ranging from Popscotch and Absolutely Minted to Banoffee Pie and Fresh Strawberry. There's sure to be at least one which you'll enjoy. And here's what I was greeted with. 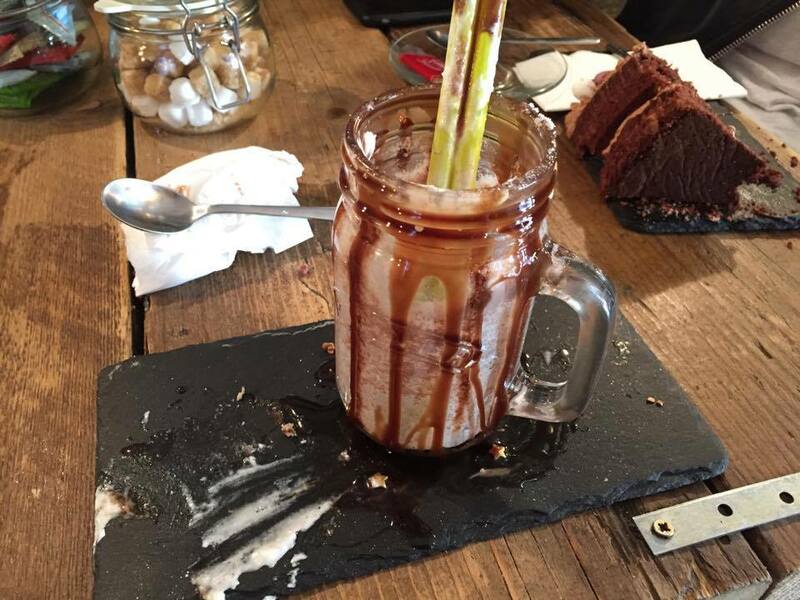 The shakes come served in a Kilner jar on a slate. The presentation looked great! 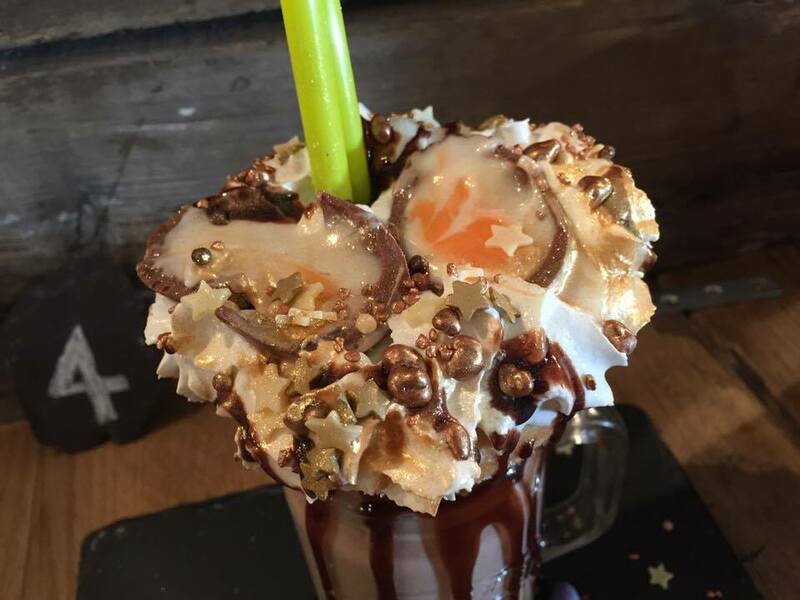 The chocolate sauce oozing down the sides, the miniature Mini Eggs around the bottom of the jar and as for the topping... A full sugared doughnut, a mountain of whipped cream, a variety of little sprinkles, a full Creme Egg cracked into two and finished off with a spritz of gold shimmer. Wow. As for the shake itself it was to die for. It has a thin consistency so really easy to drink and is blended with real chocolate so you have all the chocolatey pieces throughout. I was truly in awe. Of course I did! Come on, what did you expect!? I can't wait for my next trip to Matlock Bath. F'coffee is a must if you visit. The staff were all great and you can tell they work really well under pressure. They're always so busy here nowadays, especially at weekends and the shop itself is a lovely little find even if you're just after a coffee or a loose tea. If it's as nice of a day as when we went this time, I'll be sure to try and get a table on the front outside of the shop. I can think of nothing better to do than sit sunning it up with one of these in my hand. I've got my eyes on the Oreo flavour next. P.s. sorry about the low quality pictures. I only had my iPhone on me and not my camera. Oh well! 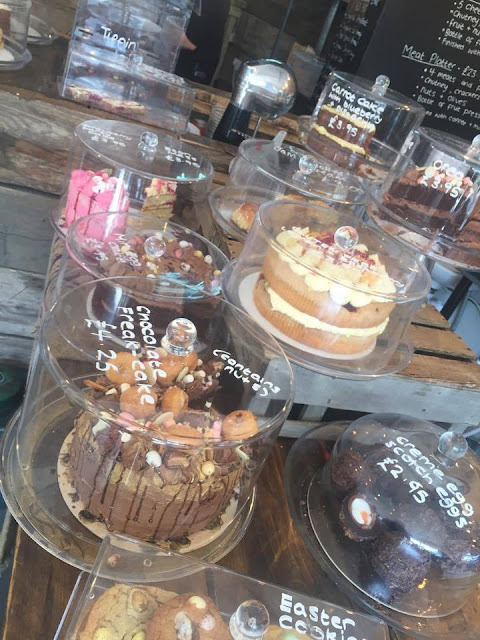 Have you been to f'coffee yet?